Wow , another suicide bomber. They should make bombs illegal like they want to with civilian owned restricted firearms then it will stop the bombings. Oh thats right they are and it still hasn't stopped. But lets all jump on the shooting that happened. Ignorant people. Last edited by ferri on Oct 29th, 2018, 1:32 pm, edited 1 time in total. Tell me where in the US I can buy ready to use bombs capable of murdering people? Tell me what large lobby group with ties to the government regularly holds conventions showing off bombs and has membership magazines telling about the latest and most destructive bombs ready to be purchased? Last edited by ferri on Oct 29th, 2018, 1:33 pm, edited 1 time in total. Reason: Try again without making it personal. Wow so quiet in here. If it had the word gun every anti would be crying up a storm. Good job castanet on your pro firearm censorship. So do you realize this happened in Tunisia North Africa? 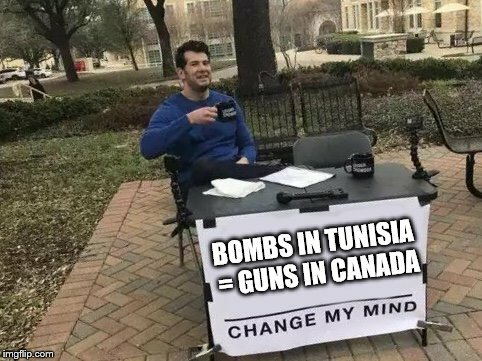 What does that have to do with gun laws or bombs in Canada for that matter? Here we go another anti who can't argue with facts. Everything to do with Canada. Lets take law abiding citizens firearms and gun violence will stop. NOT ! Blindeyes2020 wrote: Here we go another anti who can't argue with facts. Everything to do with Canada. Lets take law abiding citizens firearms and gun violence will stop. NOT ! You have no clue as to whether I am for or against. I actually agree that taking guns away from law abiding citizens will do nothing to stop the "bad guys" but that does not answer my question as to why you are ranting about something halfway around the world and has nothing to do with our laws. Clearly just looking for an argument. OP’s entire posting history is about guns. And because bombs are quite difficult to get or make there are a lot less deaths caused by civilians using bombs compared to guns. Now what would happen if it was just as difficult to get a gun as it is to get a bomb? Restricting access to bombs has been incredibly successful at keeping bomb-related murders relatively in check. Maybe some measure of similarly restricting guns would have a similar effect.